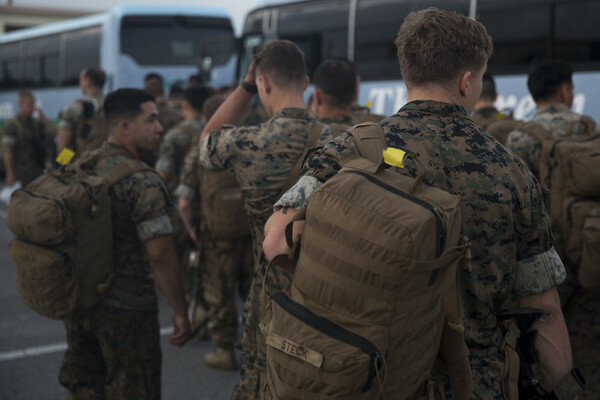 The Marines and Sailors of 2nd Battalion, 5th Marines, joined the 31st Marine Expeditionary Unit in Okinawa, Japan, May 21, 2018. This is the second time that the battalion has been the Ground Combat Element of the 31st MEU within the last two years. BLT 2/5 replaced 1st Battalion, 1st Marines, as the GCE of the 31st MEU. BLT 1/1 started their first rotation with the 31st MEU in November of 2017. These six month rotations give each BLT a chance to gain experience while also ensuring that the 31st MEU stays forward, flexible and ready. BLT 2/5 is well known not only for being the most decorated battalion, but also for their motto: “Retreat, Hell!” Around 1,200 Marines from BLT 2/5 joined the 31st MEU. During their rotation, they will participate in combined arms exercises, mechanized and amphibious raids and Fall Patrol 2018. The 31st MEU is the only continuously forward-deployed MEU and is capable of accomplishing a wide variety of military operations including humanitarian assistance and disaster relief, regional security and non-combatant evacuation.